This is a complete text of Heroes of Might and Magic 2: The Succession Wars camapigns. If you are looking to play the campaigns, don't spoil the surprises and go to another page now! If you'd just like to study the history to understand how it all began, read on. Narrator: Old man, historian sounding, kindly, blah, blah, blah. Roland: Good guy knight type. Deep voice. Archibald: Evil wizard type. Think of Tim Curry, or John Hurt in the role. Cultured, faintly British accent. "The troubles all began three years ago, with the passing of the old king, Lord Ironfist." "The king left two sons"
Dissolve to close up of Roland, the good son. "Roland was good, kindly, and honorable,"
Fade to black to both portraits and focus on Archibald, the bad son. "While Archibald was.not so good." Fade into peaceful boating scene. "Traditionally, the choice of the heir falls to the royal seer." Cut to boat sinking, flash of lightning, and dark figure in background slinking off. ".But he died in a tragic boating accident." Fade to portraits of three other seers. "His successors' luck was no better." Cut to steep angle of castle, looking down at the moat. ".with Frederick falling out of a window"
Cut to scene of a dragon blasting a tower. "Robert slain by a dragon,"
Cut to dining area, where we watch shadow of man on wall. "And Johann dying of food poisoning." Shadow slumps onto the table. Cut to image of parchment with broken seal. "Archibald accused Roland of murdering the seers, and issued a proclamation against Roland." Cut to moonlit castle, with dark figure on horseback galloping off. "Fearing for his life, Roland fled the place for his castle in the west." "With Roland gone, Archibald was able to influence the new royal seer's decision." Quick cut to close up of table. We see dagger plunge into table top and vibrate. Cut back to see Archibald's shadow leaning forward menacingly. Fade back to portrait of Archibald. 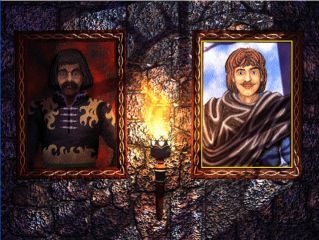 The portrait of Roland has been torn up, as with a knife. "The seer chose Archibald, and Archibald crowned himself king the next day." "And so the War for Succession began." My faithful vassal.I greet your pledge of loyalty with gratitude and relief. As you know, my wicked brother Archibald has seized my father's castle and usurped the throne. Only the lords nearest the castle have been quick to swear allegiance to him, But I fear even distant lords may take the oath in the absence of a viable alternative. I am determined to provide that alternative, even if means making war on vassals formerly loyal to my father. Therefore, it is with a heavy heart that I must order you to compel the loyalty of the barons nearest my summer palace by force of arms. Since we cannot afford to fail, I have provided you with a sum of gold sufficient to the task. I have also provided you with a magical amulet to help coordinate our war efforts. Wear it always and we will be in constant communication. Well done! Our initial move is an unqualified success. Unfortunately, we have no time to celebrate. The remainder of the local nobility is less than pleased with our recent military victories, and have organized their defenses against us. It is up to you to put down their rebellion, but I will need the forces you raised in your previous mission to secure that region properly. Once again, I needn't remind you of the seriousness of your mission. We must win in order to secure the taxes necessary to finance the war against Archibald. I am giving you the last of my gold to raise the armies you will need to force their surrender. Roklin has sent a messenger to convey his undying gratitude for your assistance against the warlocks. In return for your aid, Roklin has promised you the unconditional support of the dwarfs for as long as you should serve me. Already he has sent troops to the Carator mountains in anticipation of your move against Archibald. His forces await your command. Our seizure of the Carator mines has strengthened our position immeasurably. This strength, in turn, has begun to convince some of the more cautious lords to join our righteous struggle. Two of these neutrals have finally agreed to join our side. Their strongholds lie in a key valley that must be controlled in order to maintain supply lines to Archibald's castle. Your orders are to raise an army from the local population and launch an attack against the other two disloyal barons in the valley. Once this objective has been achieved, we will be firmly in control of the continent's resources and will at last shift from defense to offense. General, this is Roland, your rightful king. I have a proposal for you. Come and fight on my side. You and I both know that you are wrong to work for my evil brother. It must gnaw at your conscience to know that you serve an unjust usurper, and for what reward? Money? I can give you money too. I offer not just riches, but honor, duty, and purpose. Come join me and serve the cause of justice. Now, what say you? My seer informs me that you have turned down an offer to betray me. Once again, it seems, I am in your debt. You may rest assured that when all this is over your service will not go unrewarded. I have received a request for aid from the sorceresses of Noraston. Their public declaration for me has made them the object of Archibald's wrath. Archibald has sent a large army to make an example of them. They must be defended if we are to maintain our diplomatic credibility. I am sending Lord Halton to assist you in your efforts to rally the Sorceresses. And once again, thank you. You've made the right decision! If you remain true to your service with me, you may rest assured that a reward awaits you at the end of this war. I have received a request for aid from the sorceresses' guild at Noraston. Their public declaration for me has made them the object of Archibald's wrath. Archibald has sent a large army to make an example of them. They must be defended if we are to maintain our diplomatic credibility. I am sending Lord Halton to assist you in your efforts to rally the Sorceresses. And once again, thank you. I see that you have gathered your force and are poised to attack Archibald's defenders. Due to a desperate counter offensive upon my holdings here in the West, I am unable to send you aid in this crucial hour. I can only hope that the forces you have gathered, magical or otherwise, are sufficient to the task. Lord Haart will assist you in your endeavor.Oh, and one more thing-Be sure to capture general Corlagon. If we can deny Archibald his wisdom, Archibald will fall more easily. At last, the war draws to an end. My brother refuses to surrender in the face of your army, and instead sends his undead armies to continue their war against his own people. I must redirect the forces you so cleverly led to victory against general Corlagon to the defense of the people. I have decided to put Lord Haart in charge of the defense and you in charge of the attack against my brother's weakened arms. You have free access to the holdings you recently confiscated from Archibald's vassals. Use them wisely and capture my brother! Let us bring this civil war to an end! Brother Archibald, for your crimes against the kingdom and myself, I give you a mercy you surely would not have shown me: I sentence you to be turned to stone and locked in the west tower until future generations should take pity upon you and restore you to life. If they ever do. In any case, you may rest assured you will never lay eyes upon the crown again. Thank you for choosing to serve me. You will find that I can be a very generous lord to vassals who remain faithful, which is more than I can say for the cowardly lords who refuse to take the oath from me. I am King! Not Roland! No one can stand before me and refuse to serve! Go! I have allocated a sum of gold for the purposes of making an example of the lords closest to my castle. Crush them, and report back to me by means of the magical amulet I have sent you. Excellent work, my good general. I think we made an impression, don't you? The lords nearest us will certainly profess loyalty, although the more distant ones still waver. I think, however, we will require a second demonstration. In the frozen wastes to the north of us, the Krashaw region, are a number of barbarian tribes that my father did not bother to conquer. These barbarians can be powerful if organized, but fortunately they've never managed it. I am sending you there to conquer and unify them. They will make excellent foot soldiers in our efforts to put down my brother's rebellion. Congratulations. You have simultaneously weakened our enemies the wizards and strengthened our friends the Necromancers. The Necromancer's guild sends its undying gratitude, and wishes to inform you that one of their best practitioners will always be available to serve you for as long as you serve me. And now I must direct you to an urgent military matter involving the Lorendale valley barons. Two have openly declared support for my rebel brother-a crime that I cannot tolerate. You must generate an army from scratch using the castles of two of my loyal supporters. Do not fail me. Well done, general. The King of the Dwarves was so unhappy with your work that he has sent me some hate mail. It reads: "To Archibald Ironfist, Murderous and Vile Usurper: We bid you down, down, down to burn forever in the fires of eternal damnation! We pray that your foul general, who we name forevermore Dwarf-Bane joins you in this fate." (giggles) How charming! The King of the Ogres has also sent a message on this matter. It seems that they were pleased with the outcome, and have offered to permanently ally with us and send us troops. And now I must direct you to an urgent military matter involving the Lorendale valley barons. Two have openly declared support for my rebel brother-a crime that I cannot tolerate. You must generate an army from scratch using the castles of two of my loyal supporters. I will view failure with.displeasure. General! This is King Archibald speaking. Your exploits in the field have impressed me, and I have decided to offer you one chance to join me and receive a proper reward. I can offer riches and power that my brother can only dream of. Wealth and power against the certainty of the hangman's noose when I inevitably crush my brother's feeble forces. Well, what do you say? My pet necromancer overheard your conversation with my brother. You chose wisely. My brother doesn't stand a prayer of winning this war, and your head would have joined his on the chopping block. But don't fear. If you continue to serve me well I will reward you with an Earldom at my brother's summer palace. Now to business. The peasants that plow my fields are staging a rebellion directed by Roland's men. I am directing you to put this rebellion down and capture the leaders of the rebellion. I am sending lord Corlagon to aid you in your fight. Welcome to the winning side. You will see that I am an easy man to work for. I reward success and punish failure. If you are faithful and we win this war, I will grant you an Earldom. Now to business. The peasants that plow my fields are staging a rebellion directed by Roland's men. I am ordering you to put this rebellion down and capture the leaders of the rebellion. I am sending lord Corlagon to aid you in your fight. Your punishment of the peasants was inspiring. An exemplary job. Our next move is to conquer the rural lords near Roland's castle. While these lords can be defeated using conventional methods, it is the firm opinion of my chief warlock advisor that the aid of the dragon king would be an effective weapon against our enemies. Unfortunately, the dragon king will not help us voluntarily. What is your counsel, my general? Shall we launch an immediate attack against Roland's vassals, or shall we first conquer the dragons? Well done. The dragon king is cooperating with us now, and I have him on a short leash. (aha ha ha.) They will supply extra forces for our armies and will cooperate if you encounter any in the wild. Carry on with the attack against Roland's vassals. Your swift elimination of those country lords almost makes it look easy. Perhaps next time you should slow down a little, just to give them a sporting chance! (chuckles) The time to prepare for the final attack against Roland has come. My advisors are of two minds: One, that we should focus our efforts on gathering the armies necessary to defeat Roland, while the other is to search for the Ultimate Artifact. Since you are the man in the field, what is your decision? Our finest hour is upon us! Roland's forces have retreated to the province around his castle, and Roland, the fool, cowers in his summer palace, awaiting our final strike! You have gathered your forces for this final battle, now go! Crush the rebellion and bring my brother back in chains!